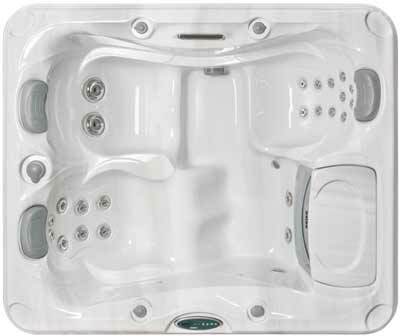 The 2 person Dover™ hot tub by Sundance Spas has everything you're looking for. With its beautiful AquaSheer™ waterfall, LED-lighted footwell, molded drink holders, and highly effective SMT™ jet variations, the Dover rises above other two person hot tubs to compete feature-for-feature with larger spas. Check out the seating – there's an Accu-Ssage™ therapy seat, and you can invite someone to sit next to you for a refreshing Hydrotherapy spa session. Ready for a 2 person spa that lets you get up close and personal? Then get ready for the Dover. Dimensions - 5'9" X 6'10" X 30.5"